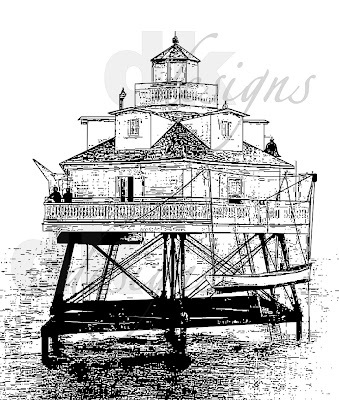 Dina Kowal Creative: Thomas Point Shoal Lighthouse - new stamp!! Thomas Point Shoal Lighthouse - new stamp!! You can view the full supplement of new releases by clicking here! This didn't photograph so well...the lighthouse is stamped on vellum that has a bit of a metallic sheen on it, and it glared a bit. The sentiment says, "Jesus is our Safe Harbor". Eyelets.......you know when eyelets were "in" I bought a billion in every color and then hoarded them, afraid to run out...well, girls - I am using them now! I used vellum on this card too.....First I colored the lighthouse image with pencils, then stamped the vellum layer, added a base layer, and sewed the 3 panels together. The verse says, "The Lord is my light and my salvation; whom shall I fear?" Awesome, awesome truth. If you've never checked out Heart & Soul and you're on the lookout for great sentiments, you should browse around the online catalog. There's definitely something there you need! And remember that unmounted stamps are just $1.50 a piece. Yeah! dkdesigns | Heart and Soul Rubber Stamp Co.
What a beautiful lighthouse. I love the cards you made with it! Oh my goodness! You just keep getting better every time! I gotta have this!